David has been an excellent PR man, going out and spreading the word and accumulating these awards. I thank him, and each of you awarding them. Awarded June 18, 1998. "...very good LCARS. I have enjoyed watching and reading your site!" Awarded June 20, 1998. "[Other sites] lacked content, some lacked design,but yours manages to group them into an array that exquisitely displays them equally!" Awarded June 21, 1998. "I won't say 'keep up the good work' because you probably will!" Awarded June 22, 1998. 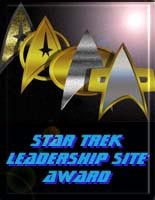 "Your site is an excellent representaion of the legacy of Star Trek." Awarded June 23, 1998. "Simply perfect!" Awarded July 2, 1998. Creative fan-based Star Trek at its finest oozes from this site. A very interesting site. Awarded July 5, 1998. "...job very well done"
Awarded July 7, 1998. "...evaluated and approved!" Awarded July 14, 1998. 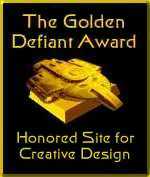 "I do love the design and the choice you are given in which to view the page." Feel like we deserve an award? Go to the main side bar menu on the databse, and email David Sands!